Ammonite would not exist without Joanna Russ’s work. Her collection, Extraordinary People, is sharp and deep and deliciously sly. At some point, everyone should read her brilliant novella, “When It Changed.” (Though if it were written today I might take issue with it.) Linked to that novella, of course, is her most famous novel, The Female Man. Don’t know her work? What are you waiting for? I actually own a copy of The Female Man, but I’ve never read it. I tried to, once, but couldn’t get into it. I’ll try again soon. Great book, <>The Female Man<>. Favorite quote:<>Men succeed. Women get married.Men fail. Women get married.Men enter monasteries. Women get married.Men start wars. Women get married.Men stop them. Women get married.Dull, dull. <>I remember way back when, early ’80s, she was interviewed by <>Isaac Asimov’s Science Fiction Magazine<>. Somehow the question came up of her sexual orientation, & she initially refused to answer; but later wrote the interviewer & said, well yes, I am. At that time it was a significant act of courage. I was walking on air all day. She had said in the interview that she didn't really think she'd ever changed anything with her writing. I begged to differ. She is the one of the greatest, and now her “descendants” are, if not legion, at least thick on the ground. As someone with an essay in that book, I’m obviously pleased that you’ve noticed it and hope that everyone will go order it before lunch tomorrow, but I’ve also been on a tiny crusade to remind people that, in addition to being the first openly gay feminist spitfire that you describe, she was a terrific SF writer who knew her way around the territory in ways that people often overlook. I’d also recommend <>The Country You Have Never Seen<> a collection of her essays and reviews that came out from Liverpool U. Press a couple of years ago. Gary, welcome.Absolutely. Russ knows the shape of SF and how to twist it into a pretzel. I wish she was still publishing fiction. I don’t know anyone with her gleaming edge.I think I’ve read most of her work–but not <>Country<> (though I’m guessing I’ve read some of the pieces in it). I really, really wish academic presses could price these things more reasonably. I wish they’d release them in electronic format. (I’m utterly addicted to my Kindle.) Still, I’ll order it from the library. Thanks for the reminder. Oh, I'm so relieved. When I saw a link to this post on Myspace, I thought Russ had died. That's what it usually seems to mean when someone of a certain age is blogposted by name. (And she's 72, and has always been dogged by bad health.) The book looks good, and since I haven't bought many capuccinos this month, I can afford to buy it.I'd second the recommendation of The Country You Have Never Seen, and not just because she mentions a Gay Community News book review in it. It's true, a lot has changed since 1970, but then, not much has changed either. Women are much more visible and active in the arts &c, but the deep-rooted gut hostility to them is still about the same as ever. Russ did a great job of describing and attacking that hostility.By the way, I never thought of “When It Changed” as a novella, just a short story. It’s not a big deal to me, I’d just never heard it referred to as a novella before. 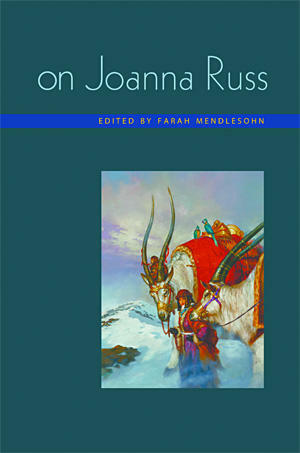 I’m looking forward to reading <>On Joanna Russ<> too. Farah, that’s excellent news. Thank you. I think Farah Mendlesohn is performing a great and wonderful thing in creating a Joanna Russ revival, which I suspect is what she has been doing over these last few years – possibly in concert with a few others, but still. Here I can actually boast; I’ve published the Swedish translations of The Female Man and of We Who Are About To…, as well as quite a few of her stories, and I consider her one of the two genuinely great prose artists in science fiction (the other, all other considerations aside, is J. G. Ballard). You really must read The Country I Have Never Seen… and I do hope you were one of the fortunate few who got hold of a copy of her What Are We Fighting For?, a thoughtful, very personal book-length essay on the women’s movement. Farah has a fine critical eye.I think Russ is brilliant–perhap better at very long story or very short novel form than full novel length. (Like Tiptree, in my opinion.) I think < HREF="http://www.amazon.com/gp/product/0819567590?ie=UTF8&tag=theofficialnicol&linkCode=as2&camp=1789&creative=390957&creativeASIN=0819567590" REL="nofollow">We Who Are About To<> is a short novel, and one of her best. It absolutely fucked with my head when I read it (about age 25). Talk about messing with the paradigm. So, I’m currently re-reading it, and I remember why I didn’t finish it the first time I tried reading it.I just don’t understand it! I’m horrible with names and can’t keep those Joanna, Jeannine and Janet persons apart. Don’t get me started on the (various?) characters describing things in first person too (can’t shake the “who is this “I” I’m reading about currently?” feeling).Anyway, I’m only at page 30 now, so I’ll just keep going, hoping that I’ll get a “ah, so there *is* a storyline in here somewhere” feeling some time in the future. It’s not for everyone. Actually I think it’s one of those books best read around the age of 25. It’s a thought experiment. Nothing goes quite as you might expect…but for those of us who prefer story to experiment, it’s not a wholly satisfying read. Well, I am currently around the age of 25… but I do think I prefer story: that’s what I read books for. But then again, didn’t know you could read books for something other (not counting poetry and non-fiction).I’ll just keep going, we’ll see how it goes. <>LL<>, oops, sorry, I had you confused with someone else. My apologies for making assumptions. Do, please, let me know what you decide. Nicola, I just finished reading <>On Joanna Russ,<> and I’m glad I got it. Now I’ve begun rereading <>Alyx<> (the Gregg Press edition), and plan to reread all the rest of her fiction. It’s been a while. Then maybe her nonfiction; I have all her books.To my taste, the best pieces are mostly in the first half of the book, which deal with her role as a feminist sf writer and critic, particularly Helen Merrick’s essay on the hysterical reaction of male writers to the work of Russ and sf feminists generally, though all of them are fine. The second half, most of which tries to force her fiction into various Procrustean theoretical beds, seems to me much less successful, though I liked Samuel Delany’s essay. And I think I should try reading Bakhtin, which I’ve been meaning to do for a couple of decades now. Excellent. Thanks for the review. I just bought <>What Are We Fighting For?<> and got <>The Country You Have Never Seen<> via interlibrary loan. Sadly, I suspect I won’t have time to read it before it goes back. Huh.